Most martial arts are activities, like sports. They're something you do with your opponent: he strikes, you block, you strike, he blocks. 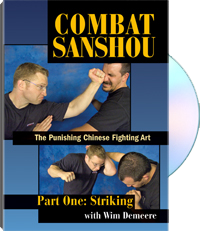 Combat Sanshou is a fighting art, and the purpose is to put your enemy on the ground without following him there: a true stand-up combat system designed for real-world combative application. In Part One of this three-part series, master martial scientist Wim Demeere provides detailed instruction in the truly devastating upper body strikes of Combat Sanshou. Beginning with the essential punches that every good fighter must have in his arsenal, such as the jab, cross and uppercut, he then goes into the brutal forearm and elbow strikes specific to this fighting art. From there, he teaches lightning-fast defenses against these attacks, demonstrating how you can string offensive and defensive combinations together to completely overwhelm and defeat your attacker. For information purposes only. Wim Demeere began training at the age of 14, studying the grappling arts of judo and jujitsu for several years before turning to the kick/punch arts of traditional kung fu and full-contact fighting. Over the years he has studied a broad range of other fighting styles, including muay Thai, kali, pentjak silat and shootfighting. Since the late 1990s, he has been studying tai chi chuan and its martial applications. His competitive years saw him win four national titles and a bronze medal at the 1995 World Wushu Championships. In 2001, he became the national coach of the Belgian Wushu fighting team. A full-time personal trainer in his native country of Belgium, Wim instructs a wide variety of clients in martial arts, self-defense and physical conditioning styles. You can contact Wim through his website and at his blog.